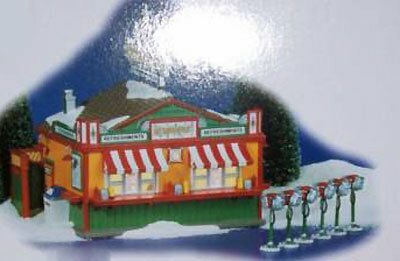 I am selling the Retired Brand New & Never Displayed Set of 7 "Stardust Refreshment Stand" from Dept.56 Original Snow Village, item #55065 The Set was introduced in 2001 and was retired in 2003, Set includes the Lighted Building and 6 speakers, measures 8.75" x 5.25" x 5.25". The Set is Brand New, wrapped in plastic and comes in the original Wrapped packaging from a Smoke & pet free enviroment. Thank You!! !